Neither liberalism nor conservatism inherently favors animal protectionism. Both can advance or impede the work of animal defenders. Many animal advocates are liberals who see animal protectionism as a logical extension of equal consideration for humans. They argue that we should include animals within our circle of compassion for the same reasons that we include humans – moral consideration for humans does not depend on their mental or physical attributes. Consequently, moral consideration for animals should depend on morally relevant features, such as the ability to experience pain and/or pleasure1 or for an animal to be able to experience being “a subject of a life.”2 However, most liberals have had little interest in animal issues. This also seems to be true of most liberal Christians, who have tend to fix their regard on humanity, rather than seeing all Creation as valuable. Conservatives, as discussed above, tend to support existing institutions. Perhaps, some conservatives fear that more equal consideration between species will make it more difficult to justify inequalities among people. 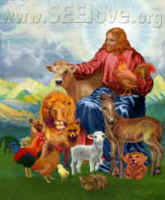 However, some conservatives have embraced animal advocacy, notably Matthew Scully, a former speechwriter for President George W. Bush, whose book Dominion: The Power of Man, the Suffering of Animals, and the Call to Mercy3 has received wide attention and praise in conservative publications. From the perspective of the scapegoating process, I see animal advocacy as potentially appealing to conservatives, because animals do not seem to have sufficient moral understanding to “deserve” ill-treatment. This view, which regards animals as inferior, does not lend itself well to animal rights, but it does favor animal welfare. Those who take animal welfare seriously4 often call for dramatic changes in the way people treat animals. Such animal welfare advocates would countenance harming animals only when absolutely necessary, which is uncommon in the West, and they would place a high priority on minimizing animal suffering. 1. Singer, Peter. Animal Liberation. New York: Avon Books, 1991. 2. Regan, Tom. The Case for Animal Rights. Berkeley, CA: University of California Press, 1983. 3. Scully, Matthew. Dominion: The Power of Man, the Suffering of Animals, and the Call to Mercy. New York: St. Martins Press, 2002. 4. Many animal-use industries have claimed to be concerned about animal welfare, but it has been my impression that this has generally been false posturing.